Length: 9.7 miles Click on the icons in the text below for photos. Walk straight across Route 173 and up Tunnel Road. Pass under I-78 after 1 mile, then watch for the right turn off the road at the second utility pole on your right (1.1). 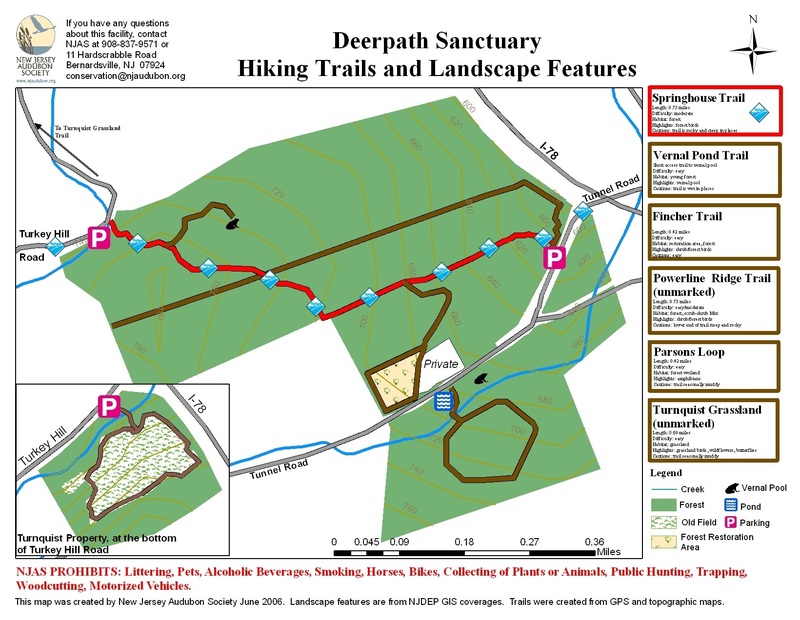 Enter NJ Audubon Deerpath Sanctuary and climb away from the road on an old woods road for a short distance, then turn left onto a narrow uphill trail. 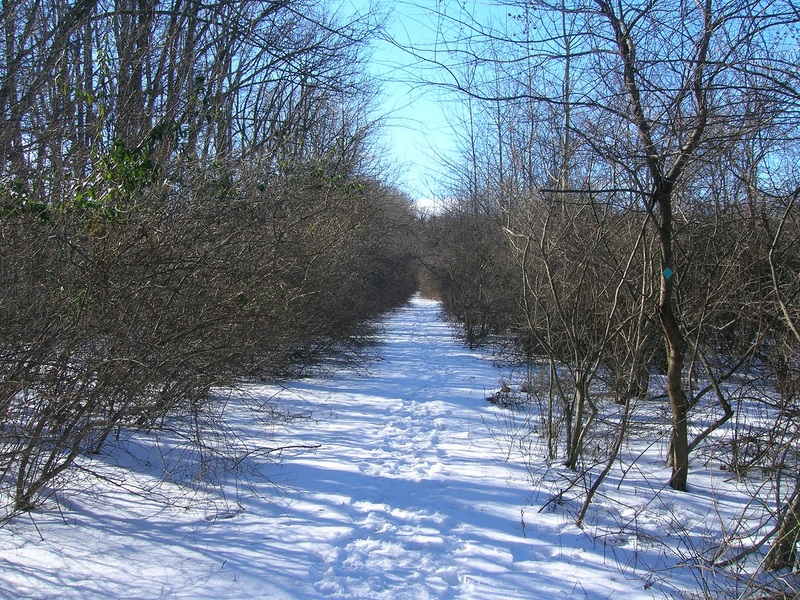 Come out to old woods roads that alternately pass through woods and overgrown fields. Proceed straight across a power line clearing (1.6) and continue on woods roads, coming down to Turkey Hill Road (1.9). Turn left and walk 1.4 miles up Turkey Hill Road, a tree-shaded, lightly used residential road. Turn right at Route 579 (3.3) and walk 2/10 of a mile to where the trail turns left off the road (3.5) into Sweet Hollow Preserve shortly after the road passes under power lines. Limited trailhead parking is available on the shoulder of Route 579. In .2 miles cross under the power lines again, following a narrow winding trail through the woods. In .5 mile, come to a woods road (4.2). Bear right on the woods road. In .1 mile pass a woods road junction on your right (4.3), but continue straight uphill. At the top of the hill turn left off the woods road onto a narrow trail (4.5). Follow this downhill to Sweet Hollow Road (4.8). Limited trailhead parking is available on Sweet Hollow Road. 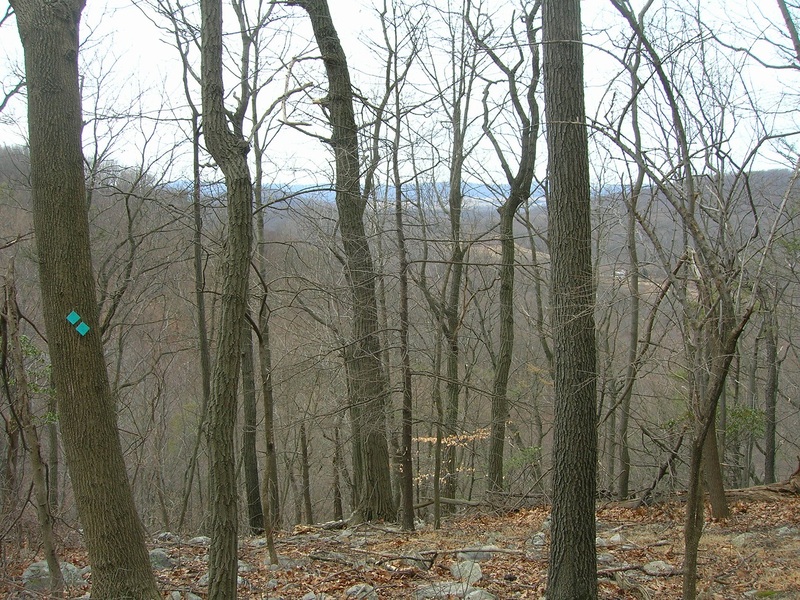 Sweet Hollow Preserve consists of several unconnected land parcels. To reach the next parcel, turn right on Sweet Hollow Road and follow it for .6 mile to where the trail turns right off of the road (5.4). Limited trailhead parking is available here. Cross a stream shortly after leaving the road, and then go uphill through woods. Cross a dirt road that passes between farm fields (6.0) and continue uphill through a narrow stretch of woods between the fields. Cross an open field (6.1), and turn right in the hedgerow between fields, walking on the rock wall. (Note: the fields are seasonally cut. If the fields are cut, it may be easier to walk the fields parallel to the rock wall.) Turn left off the rock wall (6.2) to cross an open field, a dirt road, a narrow hedgerow, another narrow field, and re-enter the woods. Watch carefully in this area for blazes – a blazed post marks the hedgerow crossing, and from here, you can see the blazed tree in front of you where the trail enters the woods. The pattern of cut fields changes frequently. Proceed up through the woods and come out to more fields, usually growing Corn. 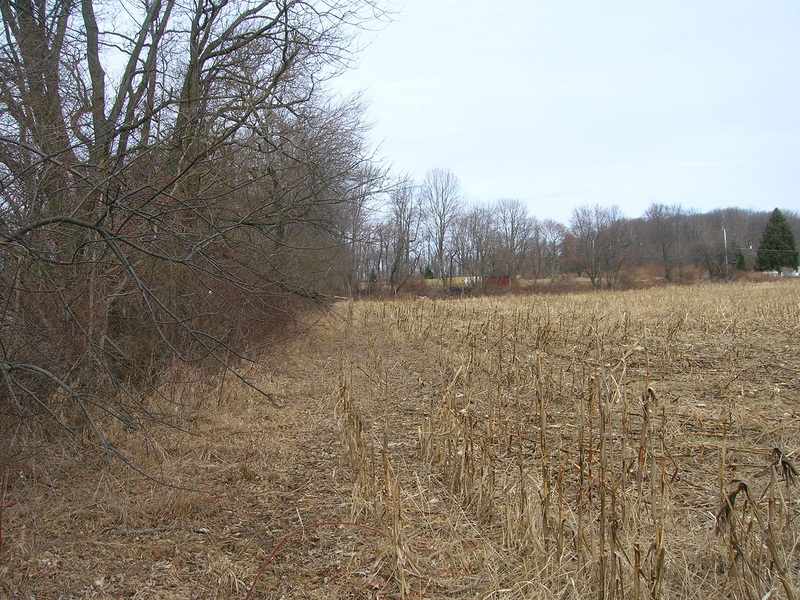 Walk around the left edge of the Cornfield, eventually coming out to Schaaf Road (6.7). Turn left on Schaaf Road and follow it to Staats Road (7.2). 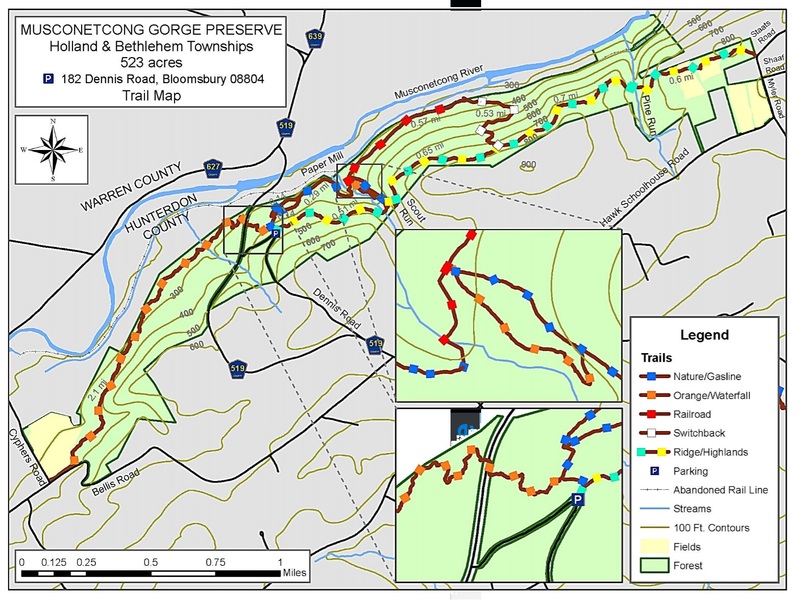 Turn right on Staats Road, and in 1/10 of a mile turn left off of the road into Musconetcong Gorge Preserve on the combined HT/Ridge Trails (7.3), marked with HT teal blazes and yellow diamond Hunterdon County Parks Dept. tags. Note: This trailhead may be difficult to see due to rapid vine and weed growth at the entrance. It is located on a bend in the road where Staats Road becomes Myler Road. Pass private “Luther Lane” on the left, a group of mailboxes on the left, and on the left at the entrance to a private dirt road is the trailhead. Do not walk up the private roads. Parking is not permitted in this area. 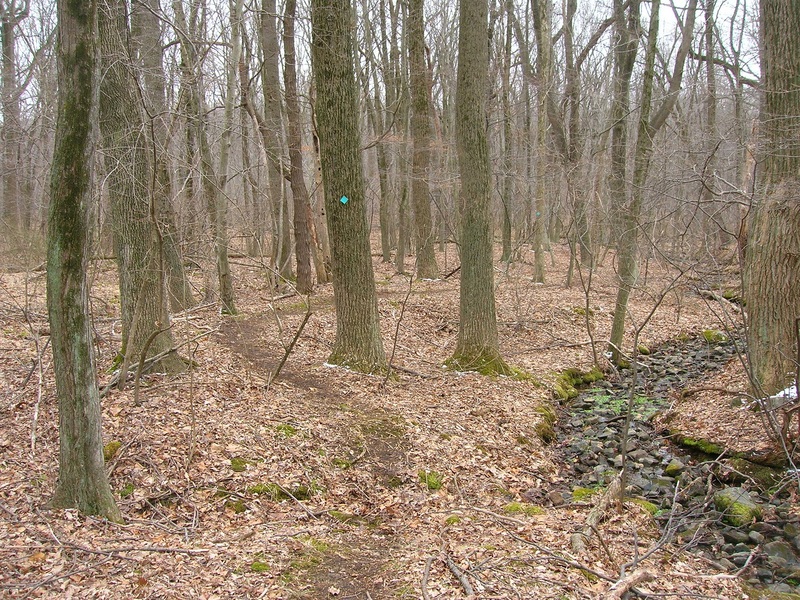 Proceed through woods, a field, then steeply downhill through more woods to Pine Run – a stream in a small gorge (8.0). Cross the stream and turn left uphill, still on the HT/Ridge Trail. Painted white blazes now join the teal and yellow tags. This is a rugged, rocky trail, much of which is built into the side of the hill and bolstered with rocks. In .7 miles, pass the white tag blazed Switchback Trail on your right (8.7). In 1.2 miles, drop down to pass the blue tagged Nature Trail on your right and cross Scout Creek (9.2). In another ½ mile come out to Dennis Road (9.7), where parking is available. The blazing temporarily ends here until a route can be secured to the Delaware River at Riegelsville, PA.